"Raven presents Blues at the Fillmore 1968-1969, ten electrifying and rare performances from MICHAEL BLOOMFIELD, NICK GRAVENITES and AL KOOPER, drawn together for the first time on one enthralling release. This remarkable collection of organic electric blues, with added jazz and modal flavours, highlights Bloomfield's playing in its full radiant glow. The late, great Bloomfield is recognised as one of the finest and most influential blues guitarists that America has ever produced. Bloomfield and renowned producer / keyboardist Al Kooper and Bloomfield and singer / songwriter Nick Gravenites, a respected bluesman in his own right, cut a numer of incendiary performances at Bill Graham's Fillmore(s) West and East between 1968 and 1969. The concerts have been spread across several album releases and this unique CD rounds out the whole story in fine style. Included are essential yet rarely heard versions of 'Born in Chicago', 'Work Me Lord' and 'It's My Own Fault' which also features a young and hungry Johnny Winter as guest guitarist. 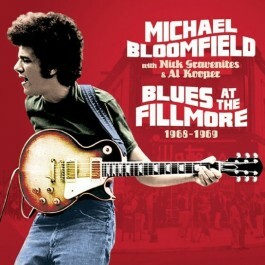 Bloomfield's exhilarating playing throughout unites everything in sheer sonic delight. 77 minutes of superb quality audio with detailed notes and color booklet."